I'm trying to hang on to the last vestiges of summer as long as I can, and that's not too hard to do when the days still insist on climbing into the nineties. Plus, there are a couple last minute summer projects I still want to post, like my daughter's jewelry drawer and my out-of-control nine foot tall tomato plants. I'll get to those next week and then happily turn my Friday Finds attention to my favorite season, fall. My children went to nearby Washington Elementary School, the oldest grade school in Boise. Each year at the end of summer, the principal welcomed the entire neighborhood back to the new school year with an old fashioned ice cream social on the lawn. 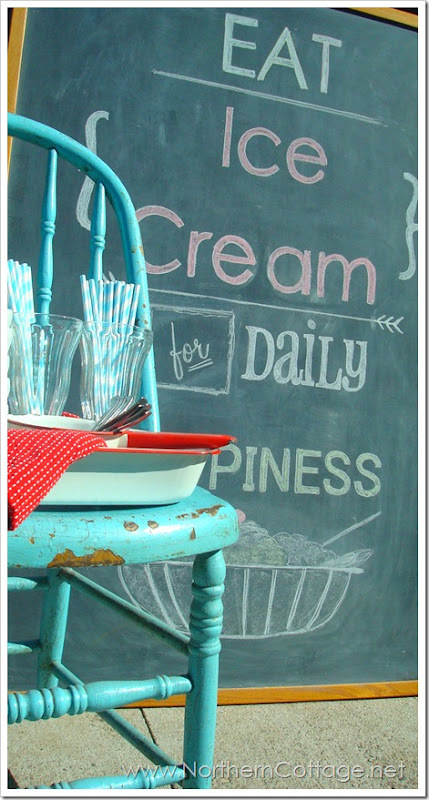 When I saw the ice cream soiree over at The Northern Cottage it brought back many fond memories of those happy days. Why not start an end of summer tradition in your neighborhood? 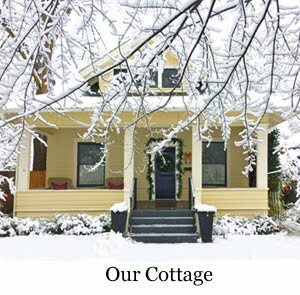 Visit The Northern Cottage for more of this cute idea and vignette. 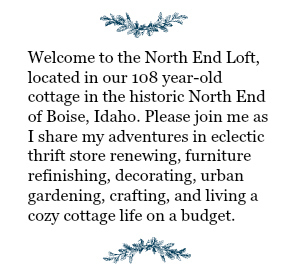 Gail at My Repurposed Life is my biggest diy inspiration. Her tool recommendations and tutorials have given me confidence to buy and use some tools for diy projects I'd probably not otherwise tackle, such as this shutter turned into a shelf by Julie from Follow My Heart Woodworking. In her guest post at My Repurposed Life, she shares a great tutorial for making it two ways, with a router or with nails. Thanks to Gail's recommendation I have a router, and since I have an old shutter out in my shed, Julie's neat shelf will be my first router project. I'll let you know how that goes! At some point I'll be reusing a dresser for a television console and will have some extra drawers that will be replaced with the cable box and DVR. The extra drawers will be perfect for these window boxes! 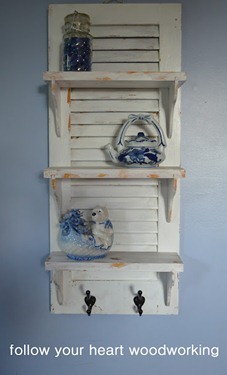 This great repurposing project is by Kammy at Kammy's Korner. Don't you love the hardware? 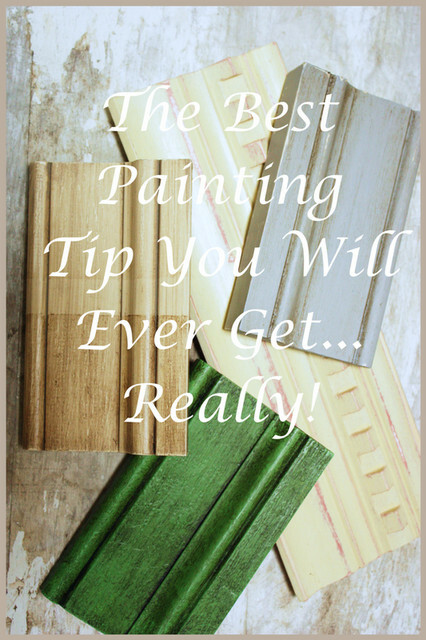 Yvonne at Stone Gable recently attended an Annie Sloan class and shares with us the "best painting tip we will ever get... Really!" What is it? "Paint a practice board before painting anything else!" I have made a lot of refinishing mistakes, so this tip is really speaking to me. Visit Stone Gable to see how Yvonne does it. Most people have never heard of fry sauce, but in Idaho and Utah it's as well known as ketchup for being the perfect accompaniment to french fries. 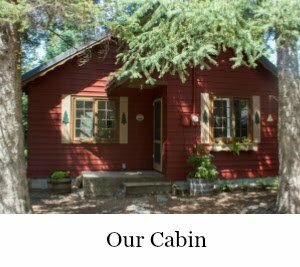 Lynn at Upcountry Olio shares her recipe for cottage fries and Utah Fry Sauce along with the warning that fry sauce can be habit forming. You'll love it! I'll be serving these at Saturday's football-watching party. This Friday Find is just for fun because I can't make it, don't need it, and unless I win the lottery, I'll never own it. 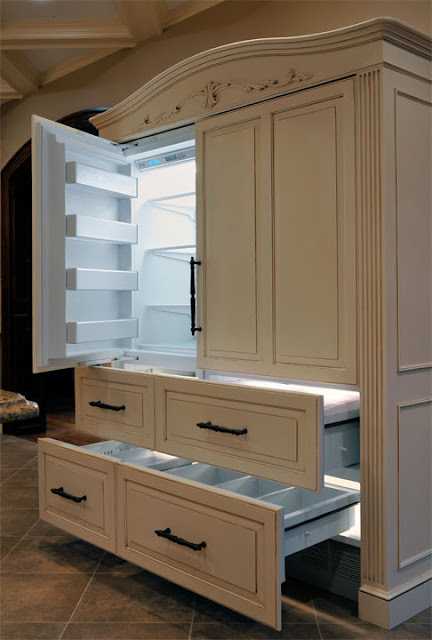 It's this AMAZING Sub Zero refrigerator freezer all decked out to look like an armoire by Kitchen Designs by Ken Kelly. This would hold a lot of fry sauce! Isn't it awesome? Laurel, i'm so glad to know that fry sauce is an Idaho thing too! Of course you guys are totally the potato experts. Thanks for helping spread the word!! Great links this week Laurel. LOVE that refrigerator! But more than that I really like the dresser drawer window box idea! Such great finds... Luv the fridge, the drawer window boxes ( how cute are they). Do feel better, and have a wonderful weekend. Thanks for sharing. But I thoroughly enjoyed the ones you showed! Feel better! Hi Laurel and thanks for showing off my shutter shelf. Please do let me know if and when you make one! Great finds Laurel and great sites too. I like your finds way better than the ones I go traipsing all over town for. These are fabulous!